Comments: Little more than a glorified rehash of the Artoo-Detoo (R2-D2) sculpt, Arfive-Defour (R5-D4) is still one very cool, unique figure. With the new head sculpt, and vac metal neck (along with red deco apposed to R2?s blue), this is definitely a figure that stands on it?s own, albeit borrowed, feet. 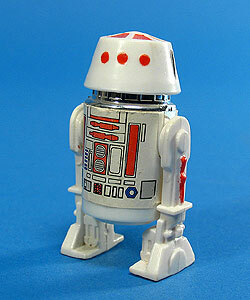 Major Variations: Though all vintage figures have minor variations, the R5-D4 figure has no major variations.